Those sad-looking, headless parking meters now have a new use: Last night, the city installed 52 "meter hitches" in Hollywood, all part of a plan that has been in the works for some time now. The hitches were added to the pole part of the old parking meters (these meters have been replaced by fancy new pay meters). Now that's what we call adaptive re-use. 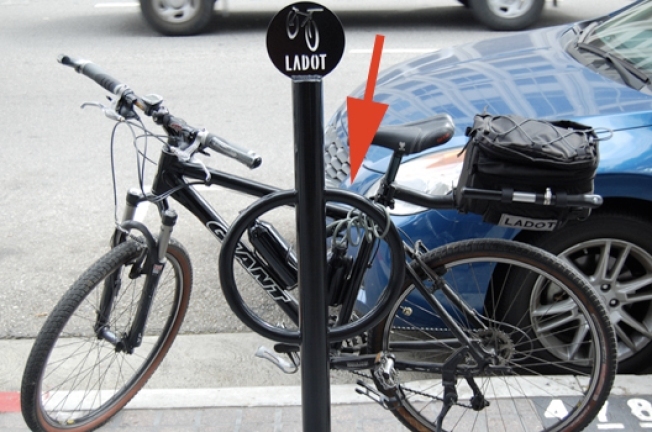 a small metal sign of a bicycle, denoting the pole as bicycle parking. as part of the first phase of the program.